Bollington Pre school would like to say a really big thank you to the Bollington Beer Festival Grant Fund who provided us with a grant to purchase a bubble tube and podium and to Cheshire East Community Grant scheme who have provided funds for us to purchase, fibre optics a light ladder, mirrors and mats. The Multi Sensory room will continue to be developed over the coming months. 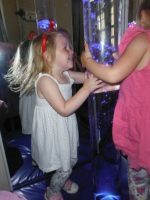 The children have really enjoyed the experience of the bubbles and the lights as part of their daily activities. The room has proved a really useful place to develop communication skills and a calm area to develop friendships, group working and one to one time. We would really like to open up this facility for use by our local community and need volunteers to help. If you think you may be interested please call Shirley on 01625 400128 to discuss further.